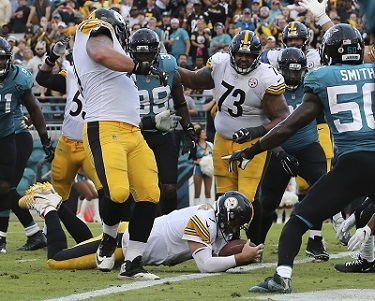 The Pittsburgh Steelers rebounded for dramatic 20-16 comeback victory over the Jaguars at Jacksonville’s at TIAA Bank Field. In doing so, the men in Black and Gold extended their winning streak to 6 games, secured a conference win, and perhaps doomed the post-season chances of a re-emerging rival. But Mike Tomlin’s Steelers also affirmed another, more important truth behind the game: Victory comes to those who play for 60 minutes. …Letting Leonard Fournette run roughshod over the Steelers defense. For a while, it looked like they might. Ben Roethlisberger played terribly for the vast majority of the game, and was particularly ineffective in the first half. Four of Pittsburgh’s 1st half possessions a ended in Jordan Berry punts. Ben Roethlisberger’s interceptions ended two others. Before the Steelers final drive of the 1st half netted 35 garbage yards, Pittsburgh’s offense totaled 42 yards. For the Jacksonville Jaguars, it was more of a mixed bag. The Jaguars made it clear that they were going to feed the ball to Leonard Fournette. But in the early going Keith Butler’s defense also signaled that they were going to contest every yard. That worked, for a while, but as the first half wore on, Forunette and Carlos Hyde started ripping off double digit runs and it was Déjà vu all over again for the Steelers defense. The Jaguars advanced relatively deep into Pittsburgh territory 3 times in the first half, but each time the Steelers defense steeled up and refused to allow touchdowns. Bud Dupree and L.J. Fort came up with big stops, and Javon Hargrave sacked Blake Bortles on third down. So instead of being down 21-0, the Steelers defense kept the difference to 9 going into the half. Running the ball might be out of fashion in today’s NFL, and that’s a shame, because something special happens when a team rushes the ball successfully. As Mike Tomlin explained, when an offense starts to rush well, piles move forward a little more; players start missing tackles, running backs routinely eek out 2-3 extra yards in the open field. The defense erodes. And “Imposing their will” has been a key ingredient to the Steelers success in this second Super Bowl era, whether that involved pounding the ball with Jerome Bettis, Willie Parker, Rashard Mendenhall, Le’Veon Bell or James Conner. There are few things better than seeing the Steelers impose their will on an opposing defense, and few things are worse than seeing a running back impose his will on Pittsburgh. And as the second half began, it appeared that the Jaguars were about to impose their will on the Steelers. And to be sure Fournette got 8 yards on his first two carries, but a penalty pushed the Jaguars back, and then T.J. Watt ended the first drive with a strip sack of Blake Brotles. 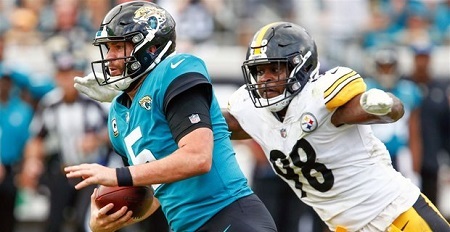 But it looked like that stop might be just a footnote in the box score, as the Jaguars took advantage of another Roethlisberger interception by ramming the ball down the Steelers throats on an 80 yard touchdown drive. That put the Jaguars up 16-0 and, on a day when its offense could do nothing right, it appeared to be the dagger in the Steelers heart. Ironically, it was the turning point of the game. After Fournette's touchdown to go up 16-0, the #Jaguars ran 13 plays for -3 yards and a lost fumble (final play ruled a fumble and #Steelers recovery). Anthony Chickillo stopped Fournette next while Vince Williams and Cam Hewyard sacked Blake Bortels back-to-back. Then the Steelers offense finally came alive, as Ben Roethlisberger hit Antonio Brown, James Conner and JuJu Smith-Schuster to move down the field, setting up Vance McDonald to make another tough touchdown catch. The Jaguars got the ball back. Everyone in the stadium knew they were going to run, and everyone knew Fournette was going to run it. Forunette got four yards on his first carry, only to have the Steelers stuff out his next two carries forcing a punt. The Steelers got the ball back with 1:42 left and one time out. A picture perfect fade pass to JuJu Smith-Schuster got the Steelers well into Chris Boswell field goal range, but Mike Tomlin opted to go for the win. Another 25 yard pass to Antonio Brown got the Steelers to the two. It would take the Steelers 4 tries, but Ben Roethlisberger ran it in with 5 seconds left to go. For good measure, T.J. Watt strip-sacked Blake Bortles again to seal the Steelers win. Steelers fans, and probably the Steelers players themselves undoubtedly wanted a dominating revenge win over the Jaguars. With a last second win, Pittsburgh failed to deliver. But the Steelers leave Jacksonville with a W, and they learned some important lessons in the process. Steelers defense stepped up against Leonard Fournette today. Great second half adjustments by the team. 1st: 14 carries, 75 yards. 5.36 YPC. 2nd: 14 carries, 20 yards. 1.43 YPC. They kept the Steelers in it all game. The Steelers also showed they’re capable of winning a game even when Ben Roethlisberger is not at his best – at least for most of the afternoon. But perhaps most importantly, the this group of Pittsburgh Steelers demonstrated that they have the discipline, the attitude and the resilience to fight to the very last minute. And against the Jaguars, that made all the difference. This entry was posted in Steelers 2018 Season and tagged Anthony Chickillo, Antonio Brown, Ben Roethlisberger, James Conner, Jerome Bettis, Joe Haden, Jon Bostic, Jordan Berry, JuJu Smith-Schuster, Keith Butler, L.J. Fort, Le'Veon Bell, Mike Tomlin, Pittsburgh Steelers, Rashard Mendenhall, T.J. Watt, Terrell Edmunds, Vance McDonald, Willie Parker. Bookmark the permalink.